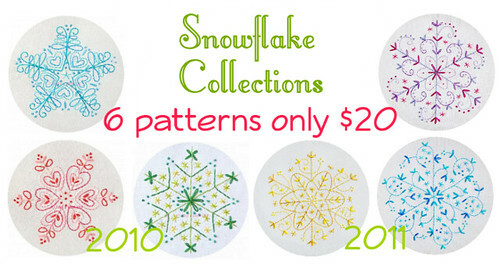 polka & bloom: Snowflake patterns! If you're not taking the Christmas Stitches class, then you're missing out on some fun projects and patterns! But fear not, like last year, you can get your mittens on the snowflake patterns! And then you can stitch the snowflakes on your mittens! There are 3 snowflakes: Blue, Gold and Lilac. They are available in the shop right now. You can also buy all three together and save a pretty penny. And if you fancy saving even more pennies, you can buy both the 2010 and 2011 collections together for a mere $20! 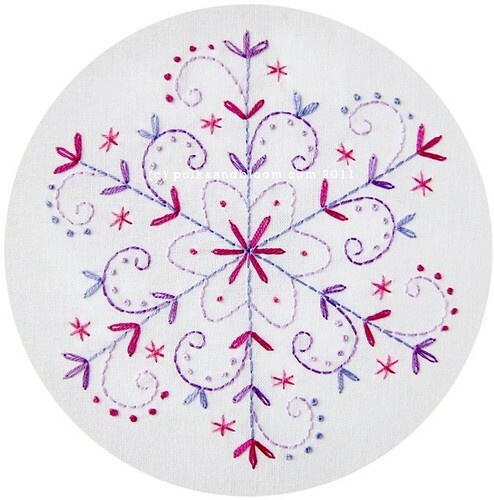 Just stumbled upon your site and have to say how beautiful your embroidery is- lovely colours.